Kent State University students, we have some great news for you: the end of the semester is finally in sight! It’s true that there are still several weeks left, but what’s also true is that Thanksgiving break is just a handful of lectures, quizzes, and hours studying at the library away. As you very well know, this November break gives students the chance to relax, recharge, reconnect with friends and family members, and ultimately, take a step back from academic life. In other words, this is a great way to set yourself up for success during finals season. It’s Time To Take A Break — Let Our Apartments In Kent Help! Once your final pre-Thanksgiving papers are turned in and you’ve got all of your academic ducks in a row, you’re probably pretty anxious to get out of Kent and head back home for a well-deserved long weekend. We fully support your quest to get back to your kin; however, there are a number of items that you’ll want to attend to before you’re on your way to the airport. With the combination of your school grind and the excitement of having several days off in mind, it’s easy to let the simple stuff slip your mind such as locking your apartment, communicating with roommates, and so forth. Keep this informal checklist in mind as you begin packing your bags, and as always, feel free to contact Kent’s Best Apartments with any questions! Unless you have a roommate who will be around during Thanksgiving break, save yourself some money — and save the Earth some energy — by unplugging whatever is plugged into your wall outlets. This includes lamps, gaming consoles, TVs, holiday lights, or any power strips that you have. The savings might be somewhat marginal, but hey, you won’t be there anyway. Why consume more electricity than you need to? Okay, we get it. That’s probably the last thing that you want to do prior to your departure, with the exception of writing another paper. However, we urge you to trust us on this one. When you’re back from your long weekend getaway, knowing that you have the stress of finals week right around the corner, coming back home to a clean and organized apartment will just feel…nice. You’ll have one less thing to worry about, and you can go straight to showering and unpacking. This makes the transition back to school relatively seamless — never underestimate the power of a clean apartment here in Kent! Perhaps you took an evening flight back to Ohio and by the time you’ve returned to your student apartment in Kent, it’s now 10:30 p.m. and you have class at 8 a.m. the next morning. Do you really want to go out for food when you just got home? Of course not. That’s why Kent’s Best Apartments recommends making a meal ahead of time that you can freeze and keep on hand for easy access. Then, all you have to do is heat it up and enjoy! The temperature of your apartment in Kent doesn’t matter when no one is there, and you’ll save a little money by not running either your air conditioning or heating. Simply turn on the heat once you’ve returned and things will quickly be back to normal. Blocking out the sun’s rays from your windows will also help keep your apartment at the same temperature, and prevent passerby from peering into an empty unit. Depending on where you’re heading home, chances are that the weather may vary drastically from what we’re experiencing. Maybe it’ll be the same as what we have, but you’re just assuming that it’s going to be warmer. Even though your folks are sure to take care of you, checking the weather ahead of time will ensure that you’re packing warm, comfortable, and weather-appropriate clothing. Balconies and patios are great for reading a book and enjoying the sunny days that we get here in Kent, but inclement weather could result in your lawn chairs flying halfway across town. If there’s anything else out there that you don’t want to get wet, we highly recommend placing your outdoor furniture inside for that additional peace of mind. We can’t stress this point enough. Above all else, make sure that your doors and windows are locked and firmly secured before you kiss goodbye to Kent. There are great people around these parts, yes, but it’s better to be safe than sorry. No one wants to answer a call or read an email about something school or work-related during the long Thanksgiving weekend. After all, Thanksgiving is a time of rest, food, fun, and quality time spent with family. Head back home with the peace of mind knowing that you’ve sent and replied to the right emails, communicated with your professors in person, and taken care of everything that you needed to do. 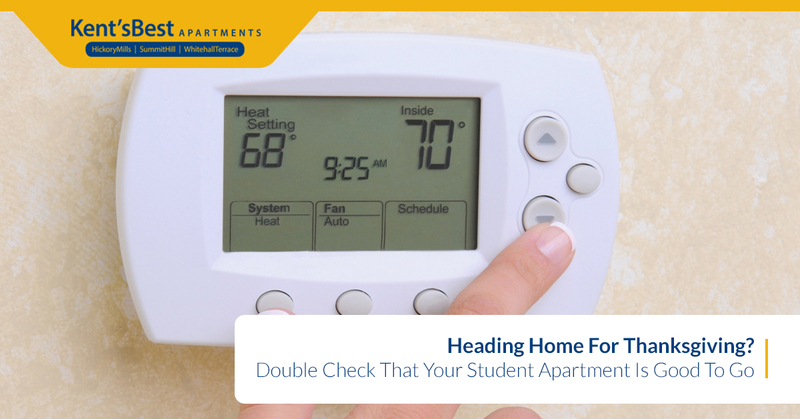 Our apartments in Kent are here to make sure that you have a comfortable and safe place to live near Kent State University — including during Thanksgiving break. Reach out to us today to let us know how we can better accommodate your stay.